It’s best to start the morning right with a good breakfast and the exercise our body needs. 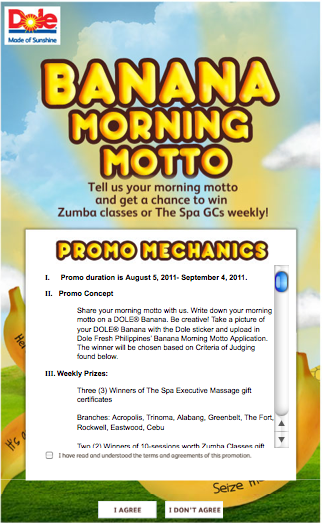 Dole Philippines has just launched a contest dubbed as Banana Morning Motto that runs from August 5 to September 4, 2011. Fruits are very nutritious and beneficial when taken during breakfast. It is Dole Philippines’ vision to empower people embrace every morning with positivity and goodness. To participate in the Banana Morning Motto campaign, all you just have to do is to write down your daily morning motto on a banana. 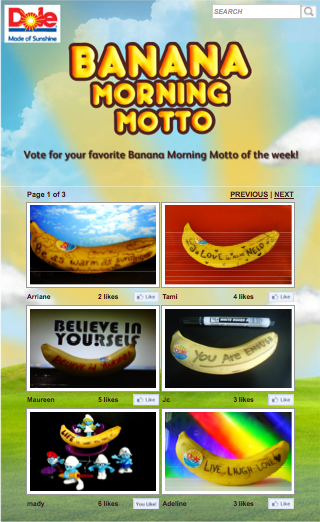 Click on the Banana Morning Motto Application on the left tab of the page. Simply upload a photo of your morning motto written on a DOLE® Cavendish Banana (make sure you’ve got the Dole sticker in place). Share it with your friends to get votes and increase your chances of winning! This contest runs for four (4) weeks until September 4, 2011. 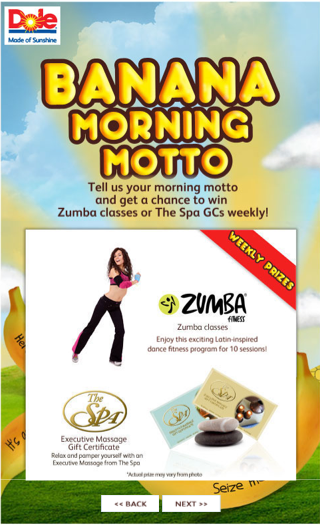 Every week, only 1 lucky entry to win prizes like Executive Massage gift certificates from The Spa, as well as free ten (10) sessions of Zumba Classes. You can check out the creative entries in the Banana Morning gallery. The next time you go to your favorite stores or supermarket, make sure you grab DOLE® Cavendish Bananas and inspire others also by being positive in the morning and upload your Banana Morning Motto. Vote for the best motto that you think captures the best positive morning! 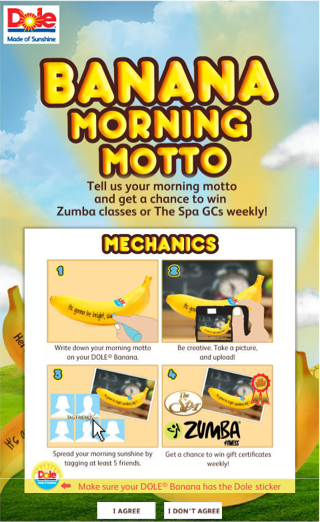 To know more, here are the Frequently Asked Questions of the Banana Morning promo.